Eid il-Burbara (Saint Barbara's Day) is a religious holiday celebrated by Middle Eastern Christians. 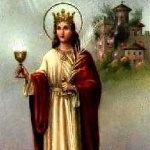 It is observed on December 4, the feast day of Saint Barbara. The holiday is celebrated by Christians in Lebanon, Syria, Israel, Palestine, Jordan, and Turkey. Saint Barbara was born in the mid-3d century in present-day Lebanon or Turkey. She was the daughter of a rich pagan. According to legend, Saint Barbara witnessed a miracle while fleeing from her father, who had kept her locked up in a tower. She ran through a freshly planted wheat field, which grew instantly to cover her track. Middle Eastern Christians recreate this miracle symbolically by planting different seeds and grains (wheat, barley, lentils, beans, chick peas, etc.) in soaked cotton wool. On Christmas, shoots from the seeds planted on St. Barbara's Day are used to decorate the nativity scene. In Lebanon, Eid il-Burbara is celebrated a bit like American Halloween. Children wearing costumes and masks go from house to house, singing songs about St. Barbara. Instead of sweets, they are given the traditional food named Burbara. The dish is made with boiled wheat or barley grains, sugar, raisins, anise, and pomegranate seeds.